A few days ago we looked at our 1st round of a 12 team PPR fantasy football mock draft. There were really no surprises there, although you'll probably see a lot of those players move up or down a few slots. Thankfully there is still football to watch, and it still is a bit fun to see how the players do so you can hype them up for next years' fantasy draft. Continuing on with our mock draft, let's take a look at what happened in round 2. This mock draft was a snake format, so we will start with the 13th pick: Julio Jones. Jones had his second best season in his career (yard-wise at least), catching 113 passes for 1677 yards and 8 touchdowns. He had 10 games where he had over 100 yards receiving. Being drafted at the 2.01 spot seems very fitting. 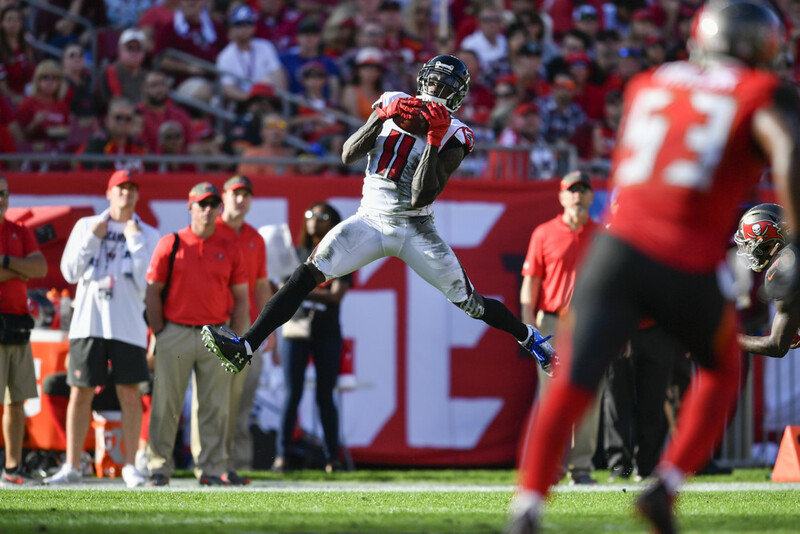 Julio never has been a big touchdown guy (8 is right around his average), but he makes up for it with huge games that wins you weeks. Continuing on with another "winning weeks" player, Tyreek Hill had his career best in receptions, yards, and touchdowns. In 2018, Hill caught 87 passes for 1479 yards and 12 touchdowns. He also rushed 22 times for 151 yards and 1 touchdown. Hill has always been known for his speed and for his use in gadget plays. My only caveat on Hill is that he is a bit inconsistent (always seems to happen at home for some reason) and that QB Patrick Mahomes may regress a tad after a potential MVP season. That being said, Hill at 2.02 seems fair. LeV Bell is our first RB off the board in Round 2 at the 2.03 spot. Bell has always been a beast, but as most of us know (and were burned) he missed the entire 2018 season over a contract dispute. There are a lot of unknowns with this one. Where does Bell go? Does he have an offensive line as good as the Steelers? Will he be out of shape after a year off? This is a high risk high reward pick in Round 2, but it will be justified if he goes to the right team. Mike Evans had some stinkers this year, but that was probably due to the ever changing quarterback. He still managed 1524 yards and 8 touchdowns on 86 receptions, and he had his career best catch percentage. The emergence of WR Chris Godwin has probably allowed Evans to avoid the double team (like he saw in years past), and Bruce Arians (rumored) as a HC could be huge for that offense. Evans is a solid early Round 2 pick. At 2.05 we see our 2nd 2018 rookie: Nick Chubb. Chubb didn't get the start until Week 7, but he still managed to rush for 996 yards and 8 touchdowns. Imagine what he would have done if he started all 16 games. That's probably why he is being drafted so high. Chubb doesn't catch the ball much, but if he can run like he did in 2018, Chubb will be a great value in Round 2. WRs JuJu Smith-Schuster and Adam Thielen follow Chubb at the 2.06 and 2.07 spots. JuJu expanded on his great rookie season in 2017 by exploding for 111 catches, 1426 yards and 7 touchdowns. JuJu seemed to take over the main WR role (sorry AB), and with Antonio Brown asking for a trade, JuJu might be the de facto #1 target in Pittsburgh. Thielen started off hot, putting up at least 100 yards in the first 8 games (breaking a record). After that, he only recorded 1 game over 100 yards. He finished 2018 with 113 receptions for 1373 yards and 9 touchdowns. Even with those great numbers, fantasy owners probably felt let down by the WR. Thielen at 2.07 seems a bit high, especially since that offense is in a bit of disarray. I'd probably take T.Y. Hilton and Keenan Allen over him. Before we get to them however, let's look at RB David Johnson, who was drafted at 2.08. Johnson had a disappointing season in 2018, rushing for 940 yards and 7 touchdowns and catching 50 passes for 446 yards and 3 touchdowns. That's a far cry from the 1000 yards rushing plus 1000 yards receiving Johnson said he wanted to get. The Cardinals' offense was awful and rookie QB Josh Rosen was constantly under pressure and causing turnovers. It's also super frustrating to watch the OC consistently run DJ right up the middle into a crowd over and over and over. Hopefully a new coaching staff and a few free agent signings helps DJ return to form. At 2.09 and 2.10 we got another pair of receivers: T.Y. Hilton and Keenan Allen. Hilton benefited thanks to the return of QB Andrew Luck, and should further benefit if Luck stays healthy. Hilton caught 76 passes for 1270 yards and 6 touchdowns (right around his averages). Allen had a slight regression from last year, catching 97 passes for 1196 yards and 6 touchdowns. It's a bit disappointing especially since QB Philip Rivers had a MVP type of season, but Allen still deserves a later 2nd round pick. Not surprisingly, our first QB comes off the board at 2.11. Patrick Mahomes had one of the best seasons by a QB in recent history, completing 66% of his passes for 5097 yards, 50 touchdowns, and 12 interceptions. You know who else threw for over 5000 yards in a season? Dan Marino, Drew Brees, Tom Brady, and Peyton Manning, to name a few. Only Peyton Manning and Tom Brady have thrown for over 50 touchdowns in a season, and only Manning has thrown for both 50 tds and 5000 yards. That's quite a feat for a 2nd year QB. Now Mahomes might regress a bit (or a lot) next season, so I personally would not draft him this high. But make no mistake that he will go 2nd or 3rd round in your draft. Finally, we see longtime WR A.J. Green at the back of the 2nd round (2.12). Green had a season to forget, catching only 46 passes for 694 yards and 6 touchdowns. The Bengals as a whole were a dumpster-fire, and Green only played 9 games due to injuries. Green could easily slip into the 3rd round, and I probably won't be too enthusiastic drafting him. Green will be 31 and in an offense that has not been good for some time. QB Andy Dalton isn't good, and worst of all Green has been injury prone the last few years. I would probably take Diggs or one of the Rams WRs over AJ Green in this spot.